Weeks ago Ford told Ram to cease and desist making "best-in-class" heavy-duty towing claims. Ford says their new F-450 competes with (and bests) the Ram 3500, but Ram says phoey, and they're juicing their 6.7 Cummins engine by an extra 15 lb-ft of torque to take top-output for the 2015 model year. "Best-in-class" claims have reached the point of peak convolution and nobody should care about them. Buy the truck you like that's set up for what you need to do with it because manufacturers are always going to be one-upping each other on one stat or another. We've already discussed the current Ford vs. Ram towing-claim debate at length (see above for a refresher). As it stands, Chrysler is sticking to their story that the 30,000-pound pulling Ram 3500 has the max capacity in Class 3, and that the 2015 Ford F-450 pickup, which can apparently tow 31,200 pounds, is Class 4. Ford supposedly still says the F-450 pickup, which sits on a different frame as the F-450 chassis cab, is fact a Class 3 truck. The weight limit to stay under for Class 3 is a total vehicle-plus-payload of 14,000 pounds, which the F-450 is under in some configurations and over in others. As far as I see it, the fact that Ram is still making "best in class" a big part of their 2015 model-year marketing push can only be interpreted two ways: that "best-in-class" claims are so important to them they're willing to go to court over it, or they recognize the claim is so arbitrary Ford won't be able to make a case against them. Ram 3500 continues towing leadership at 30,000 pounds and adds a new notch in its belt with a chart-topping payload of 7,390 pounds. The payload claim was made possible by challenging the Ram 3500 6.4-liter HEMI V-8 pickup with an increase in GVWR of 100 pounds, now 13,800 pounds GVWR. Ram is obviously not relinquishing the title without a fight, and now what choice does Ford have but to take it to litigation or stop arguing about it? There's always option three: the two companies just stay locked in a battle over semantics for eternity, or until one of them really redesigns their heavy-duty truck. Jury's out on which of those will come first. To scramble to the top of another meaningless bench race, Ram has dialed up their Cummins 6.7 liter inline-six with more fuel and boost to up its output to a blackhole-spawning 865 lb-ft of torque. Max horsepower presumably stays at 385, as it wasn't mentioned in today's update from the company. For those of you diligently keeping count of all these numbers, this puts the strongest Cummins engine at 5 lb-ft of torque over the 2015 Ford 6.7 Power Stroke diesel, which is good for 440 horsepower and 860 lb-ft of twisting force. Ram's beefiest Cummins ships with a commercial-grade Aisin transmission. They also offer a 350 horsepower/660 lb-ft of torque variant (with a manual gearbox) and a 370/800 lb-ft of torque (with a 68RFE automatic) in their heavy duty pickups. 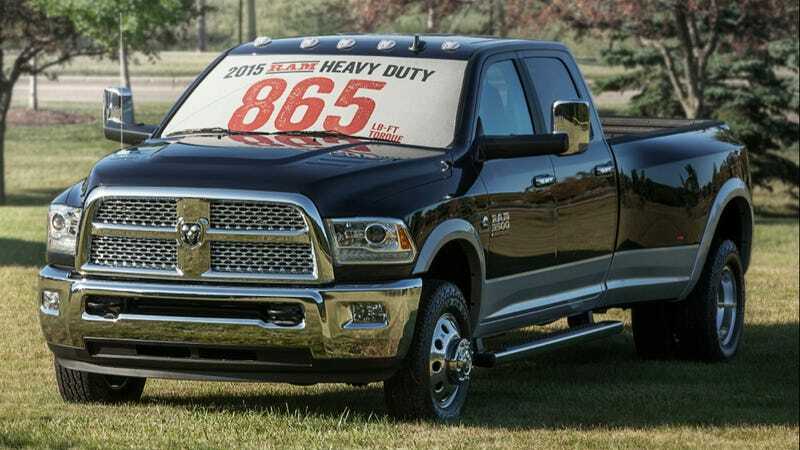 "The payload claim was made possible by challenging the Ram 3500 6.4-liter HEMI V-8 pickup with an increase in GVWR of 100 pounds, now 13,800 pounds GVWR." So yeah, they put an extra 100 pounds in the bed and didn't break it. Or maybe they didn't and just figure it can handle the weight for the sake of another "best" title. You'll never know! And yes, I'm sure Ford will be dialing up their payload soon using similar science. How much horsepower makes a difference to you when you shop for trucks? Or pound-feet of torque? Or pounds that can fit in the bed? Of course we need to have truck capabilities published by the companies that make the trucks, so we know (roughly) what we're buying and (more importantly) what you can do and still have your warranty honored. All I'm saying is; compare the truck you're looking at to comparably-equipped rivals. Ignore the noise from commercials and billboards; even if the "best-in-class" title applies to the rig you want it's probably over a handful of horsepower or a few beer cases worth of weight.